Product prices and availability are accurate as of 2019-04-20 07:41:27 UTC and are subject to change. Any price and availability information displayed on http://www.amazon.com/ at the time of purchase will apply to the purchase of this product. IMPORTANT: Model MD1600 is a great choice for most ADSL and VDSL services from CenturyLink, Frontier, Windstream, TDS Telecom, and Fairpoint. Model MD1600 does not work with Bonded VDSL, Bonded ADSL, or VDSL vectoring. PLEASE READ THE CHECKLIST in the product images on this page before purchasing this product. 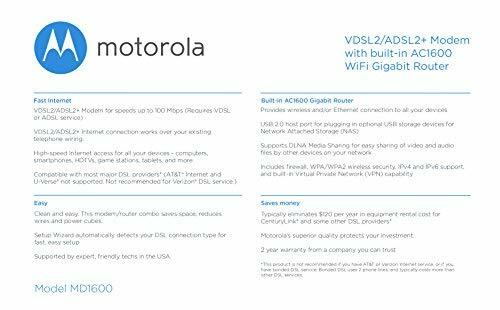 If you're still not sure whether you have the right type of DSL service, BE SURE TO ASK YOUR SERVICE PROVIDER BEFORE purchasing this product. MODEL MD1600 IS NEVER COMPATIBLE WITH VERIZON OR AT&T SERVICES. The MD1600 IS NEVER compatible with Comcast, Charter Spectrum, Cox, or other cable services. Model MD1600 is a VDSL2/ADSL2+ Modem combined with a built-in AC1600 WiFi Gigabit Router, delivering high-speed Internet to all your WiFi and Ethernet devices. Supplying your own modem typically saves $9.99 in modem rental fees for CenturyLink, and savings vary for other service providers. The MD1600 supports speeds up to 100 Mbps, and speeds also depend on the speed of your VDSL or ADSL service. (VDSL or ADSL service is required.). The MD1600 Internet connection works over your existing telephone wiring and provides high-speed Internet for your Ethernet and wireless devices - for instance, smartphones, computers, HDTVs, game stations or streaming media devices. The MD1600 includes a USB 2.0 host port for attaching optional USB storage devices for Network Attached Storage (NAS). which supports DLNA Media Sharing for easy sharing of video and audio files by other devices on your network. Setup is fast and easy using our Quick Start guide. Our experienced USA-based customer support specialists are ready and willing to help if you need them. 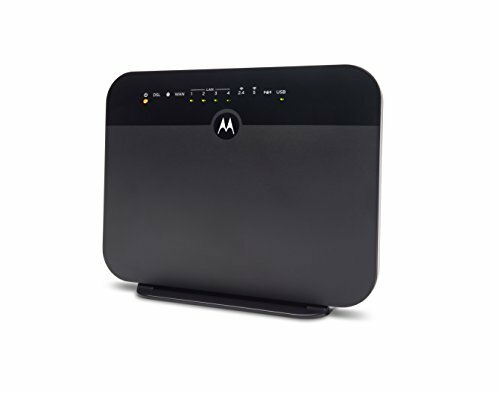 With Motorola extras including advanced surge and lightning protection, easy installation, a 2-year warranty, and superb customer support, Model MD1600 is a superb choice for customers who want the ultimate in DSL modem performance. The MD1600 is a great choice for CenturyLink, Frontier, or most other ADSL or VDSL services. It combines a VDSL2/ADSL2+ modem with a full-featured AC1600 WiFi Gigabit router to provide fast Internet to all your WiFi and Ethernet devices. DSL services use the telephone wiring in your home Eliminates about $10 a month in modem rental fees at CenturyLink and many other DSL providers and provides excellent WiFi coverage. (Does not work on AT&T U-Verse, Bonded VDSL, Fiber, or CenturyLink installations that use VDSL vectoring. Not recommended for use with Verizon or AT&T DSL services.) Clean and easy. 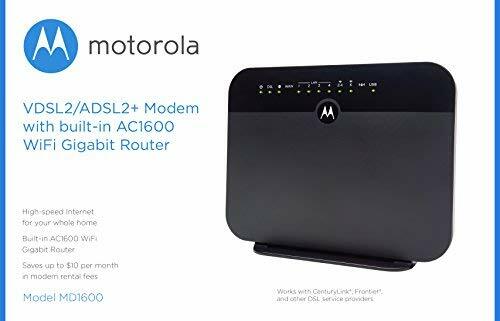 This DSL modem/router combo saves space, reduces wires and power cubes, and includes a setup wizard for fast, easy installation. Works over your telephone wiring. Delivers Internet speeds up to 100 Mbps, and speeds also depend on the speed of your VDSL or ADSL Internet service. Using it built-in router, the MD1600 provides a high-speed Internet link for all your wireless and Ethernet devices including smartphones, HDTVs, computers, tablets, game stations, and more. Built-in router includes four Gigabit Ethernet ports, AC1600 wireless, a firewall, WPA/WPA2 wireless security, IPv4 and IPv6 support, and Virtual Private Network (VPN) capability. You can plug a USB storage device into the MD1600's USB 2.0 host port for Network Attached Storage (NAS) which supports DLNA Media Sharing. The MD1600 is supported from the USA by expert, friendly customer support specialists. 2 year warranty from a company you trust.